I recently got my hands on a packet of dried oyster mushrooms from Kennett Square, Pennsylvania. It seems that mushrooms from this region have quite the reputation. As in, they’re supposed to be seriously good. Not one to buy into hype without some first-hand experience, I wanted to really give these ‘shrooms a taste. This meant I’d need to use them in a way that would let their flavor shine, and adding them to a simple risotto seemed like the perfect way to do just that. Risotto is one of those things that, for some reason, has developed a reputation for being difficult to make. Don’t get me wrong, I have seen people mess it up–and royally–but I have a feeling those mishaps have more to do with a misunderstanding of what risotto is. Risotto is not merely rice with stuff in it. Rather, it is a creamy, comforting dish and a canvas for a multitude of flavors. The true beauty of the marriage between risotto and dried mushrooms lies in the soaking liquid. Dried mushrooms are almost always reconstituted before use by soaking in warm water. The water not only rehydrates the mushrooms, but it also becomes infused with concentrated mushroom flavor. Since risotto is made by gradually stirring liquid into starchy rice, the soaking water can be saved and used to further intensify the final dish. And the flavor of this risotto is decidedly intense. It almost seems like it wouldn’t be a good thing, but, once the initial surprise passes, the full, smooth taste of the oyster mushrooms is a total pleasure. I’m sure it’s obvious–my verdict on the Kennett Square ‘shrooms is that they’re worthy of whatever hype may surround them. 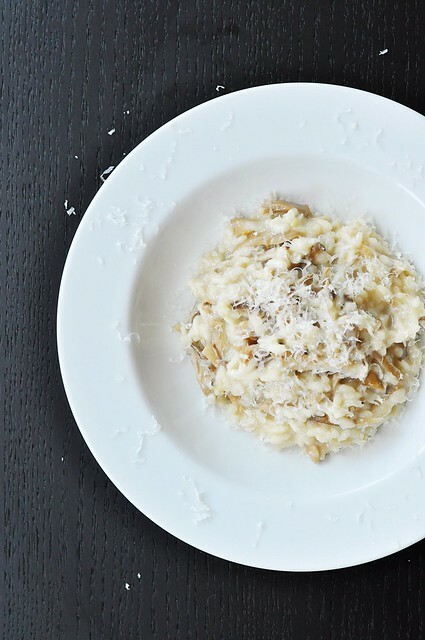 I didn’t dress them up with any fancy herbs or spices, nothing more than a sprinkling of Parmigiano (and that’s only because I can never seem to help myself when it comes to parm), and yet the risotto tasted deep and complete. Also, the texture of these was far superior to the cardboard-like chew of some dried mushrooms, giving way between the teeth with a plush, slightly firm bite. If you find yourself in possession of some good dried mushrooms (from Kennett Square, if you can find ‘em), I highly recommend enjoying them this way. This was my first experience with oyster mushrooms and they were fabulous. If you can’t find them though, you could substitute another dried mushroom of your choice. The final flavor of your risotto will obviously vary depending on the variety you choose. To make this vegetarian, substitute water for the chicken stock; vegetable stock will impart too strong a flavor. 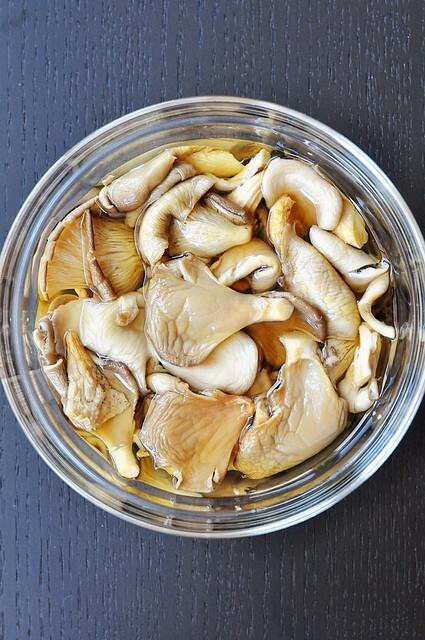 Place the dried mushrooms in a small bowl and cover them with the warm water. Allow to soak for at least 30 minutes, until tender and rehydrated. Remove the mushrooms from the soaking liquid, gently squeezing out any excess. Strain the soaking liquid through a fine mesh sieve–first lining the sieve with paper towel or a coffee filter if appears particularly gritty–and set aside. Thinly slice the rehydrated mushrooms. Pour the chicken stock into a small saucepan and set over low heat to keep warm. Warm the EVOO and butter in a medium saucepan over medium heat. Add the shallots and a pinch of salt and saute the shallots until they’re translucent and soft. Add the garlic and saute for an additional minute. Pour in the rice and cook for 3-5 minutes to allow it to toast slightly. Deglaze the pan with the white wine, if using (if not, add stock here instead). Cook, stirring constantly, until the pan is almost dry. Add the chicken stock a ladleful at a time, cooking until the rice has absorbed most of the liquid before adding more. Stir frequently–this releases the starches in the rice, giving the risotto its creamy consistency. Once the risotto has been cooking for about 10 minutes, add the sliced mushrooms and begin to add the reserved, strained soaking liquid in place of the stock. After all of the soaking liquid has been incorporated, resume adding the chicken stock. The risotto is done when it has a creamy consistency and the rice is cooked to al dente (there will be stock leftover). 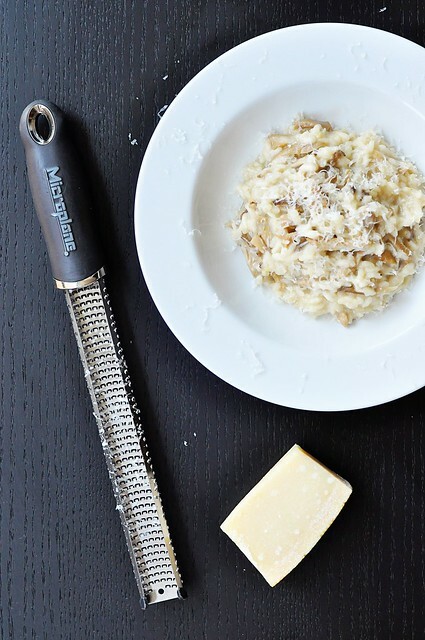 When the risotto is finished cooking, stir in the Parmigiano reggiano. Add more stock to loosen the consistency, if needed. Taste and adjust for salt. Serve with additional grated Parmigiano for sprinkling over the top. Yum! I could probably eat a vat of that! 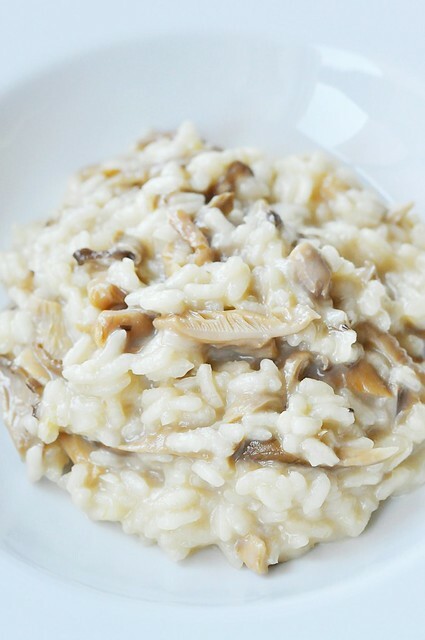 I love mushrooms and risotto…how could this not be amazing?!?! My does this look delicious, this is a must try. Love the photo… so mouth watering. Even though I have fresh oyster mushrooms at my fingertips I want to rehydrate some of those that I dry just to get that infused flavor for my next risotto dish! Thank you Britt for opening up a whole new world for me. I just dried another batch of Kennett Square “grown” oysters and shiitakes yesterday. Looks and sounds amazing! I love mushrooms – all of them – I can’t pick a fav. I think the key is to learn from one another, so the more information out there to the masses, the better. With this in mind I’ve started a blog hop for anyone dealing with allergies, eczema, or asthma, either for themselves or as a caregiver. If you’re interested in joining, please add a comment. I’d love to welcome you to the group.